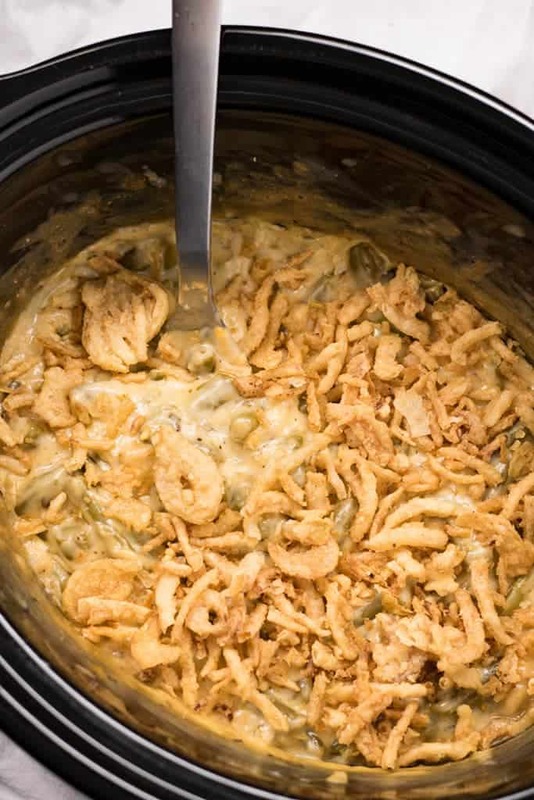 Cheesy Crockpot Green Bean Casserole – This green bean casserole recipe is everyone’s favorite holiday side dish made even easier in the Crockpot! Full of either fresh, frozen, or canned green beans, cream of mushroom soup, french fried onions and cheese this casserole is an easy crowd pleaser! It’s definitely safe to say that green bean casserole is my favorite side dish at Thanksgiving and Christmas. If I could get away with it, I’d pass on the turkey and steal the whole casserole for myself! Well, and maybe some of these Cream Cheese Mashed Potatoes too. We all know that green bean casserole is already impossibly easy to make. Why not make it even more simple, save some space in the oven, and add it to the slow cooker? If you’re someone with a big family and a GIANT turkey, you know you need that extra oven room! So, I have tested this recipe out a few different ways and I am happy to say that you can use whatever type of green beans you prefer! Fresh, frozen, or canned work out perfectly. I typically use canned because that’s just what I always have on hand for busy nights when I don’t have time to prep fresh veggies for dinner. Now, let’s talk about the cheese! Adding cheese to my green bean casserole was an experiment that I tried many moons ago and now I prefer the addition. I add parmesan and cheddar to this recipe and it’s a glorious combination that sends the casserole to a heavenly level of creamy goodness. If you aren’t into creamy or cheesy-ness then please feel free to leave the cheese out! You can add one cheese, both, or none, and it won’t affect the outcome of the recipe at all! Another quick thing to talk about is the french fried onions. I always add half of the can right into the green bean mixture in the Crockpot. I like the onion flavor all throughout! If you want all of the onions to be crispy, then just wait and add the whole can on top before you’re ready to serve. Enjoy! Don’t forget to follow me on Facebook to see all of the yummy recipes and videos we share every day! If you’re looking for a fantastic holiday stuffing check out my Slow Cooker Cornbread Stuffing! 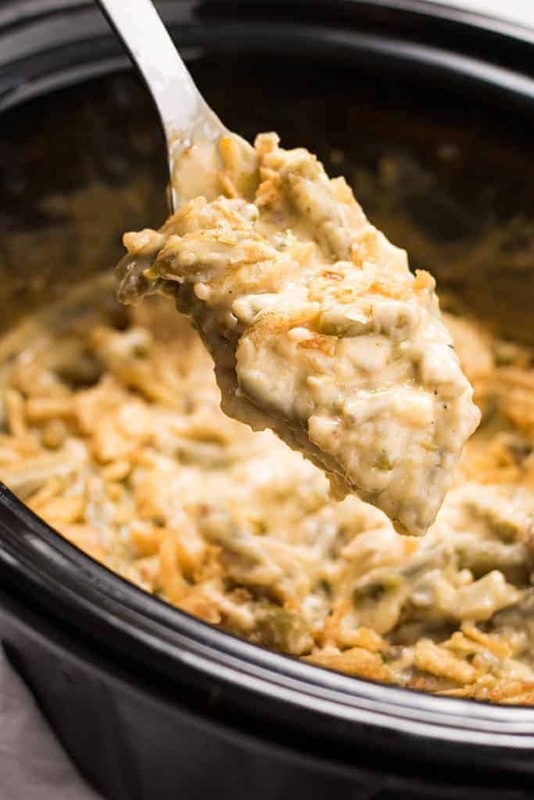 Cheesy Crockpot Green Bean Casserole - This green bean casserole recipe is everyone's favorite holiday side dish made even easier in the Crockpot! Full of either fresh, frozen, or canned green beans, cream of mushroom soup, french fried onions and cheese this casserole is an easy crowd pleaser! 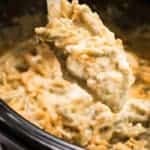 In your crockpot combine the cream of mushroom soup, sour cream, milk, and seasoning and whisk to combine. Stir in the green beans, cheddar, parmesan, and half of the french fried onions. Place the lid on your crockpot and cook on low for 2 hours. NOTE: The cheese in this recipe is optional. NOTE: After cooking this casserole can be left in the crockpot on warm for up to 2 hours. NOTE: If you are using fresh or frozen green beans instead of canned I recommend using a total of 24 ounces or 1.5 pounds total. Do you make this with regular green beans or French cut? I am excited to try this recipe. What size crockpot does it take? If I use fresh green beans, do I need to precook it – if not will the fresh green beans cook enough after alloted time? Looking forward to making this for Thanksgiving! Can I double the recipe, and if so, how would that affect the cooking time? Thanks! Yes, you should be able to double it and just make sure your crockpot is large enough! As far as cook time, it should be about the same. Is the cooking time the same for fresh green beans? I have a very picky eater, is there something I can use instead of the cream of mushroom? Comfort food at it’s best. Full on green vegetables too! Anything that will help me feed the kids with some nutritious green veggies… I’m sold! This one of the best green bean casserole recipe. I like the cheesy version. I make with cream of mushroom but not added cheese to it. 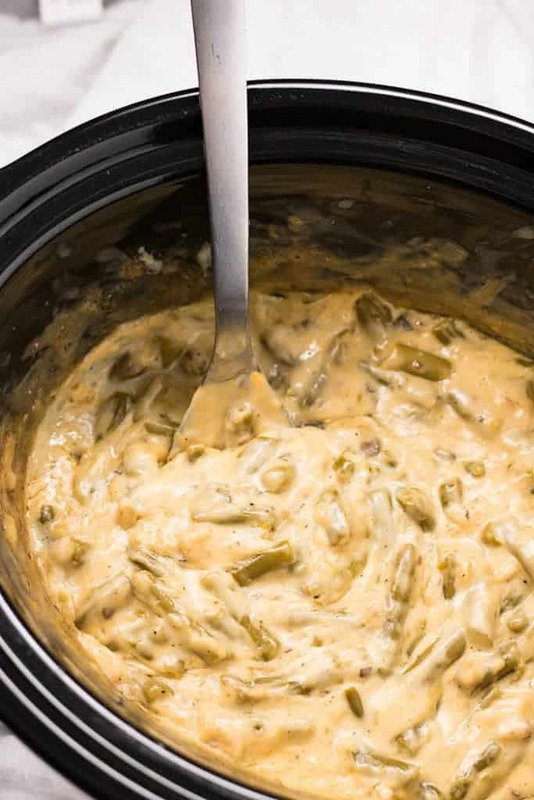 Who doesn’t just love that green bean, cheesy casserole. This is awesome that you can make it in the crock pot! It looks so good! A cheesy casserole? Count me in – this looks so delicious! I love that this can be made in a slow cooker. That will help save oven space when cooking a large meal.